In evaluation test the patients plantar-flexion strength. With all of the patients weight on each extremity individually, have the patient raise up onto their toes. If the patient is unable to raise their heel or can only slightly raise their heel off the floor. The deficit weakness will generally require a firm spring strength. If the patient is able to raise about half way up, they would generally require a moderate strength. If the application of the orthosis is for the purpose of Queing knee position in stance of gait. 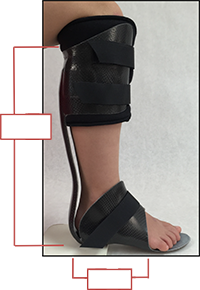 (Crouch gait, hyper-extension, toe walking) A firm spring would be desired, a moderate strength will not produce enough force and the patient will generally overpower the orthosis.